Korea is a beautiful country located on the Korean Peninsula in Northeast Asia, often referred to as the “Land of the Morning Calm”; A country surrounded by sea on three sides, while boasting green forests, open fields as well as meandering rivers. Korea is a place that is alive with a rich tradition and culture that spans 5,000 years of history; An attractive country of changing sceneries and foods in each distinctive season of spring, summer, fall and winter; and A nation that produced the “Miracle of the Han River”, a stunning economic and social transformation forged by its people out of the ashes of the Korean War in 1950 and the subsequent division of territory. The Korean Peninsula extends southward from the eastern end of the Asian continent. 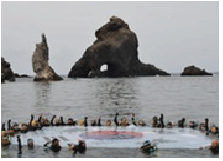 It is roughly 1,000 km (621 miles) long and 216 km (134 miles) wide at its narrowest point. Mountains cover 70% of the land mass, making Korea one of the most mountainous regions in the world. 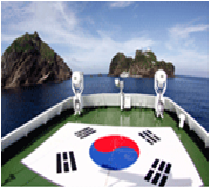 The mountain range that stretches along the east coast falls steeply into the East Sea, while along the south and west coasts, the mountains descend gradually to the coastal plains that produce the bulk of Korea’s agricultural crops, especially rice. The peninsula is divided just slightly north of the 38th parallel. The Republic of Korea in the south and the Democratic People’s Republic of Korea in the north are separated by the Demilitarized Zone. The Republic of Korea consists of eight provinces and one special self-governing province (do); the capital Seoul; the six metropolitan cities of Busan, Daegu, Incheon, Gwangju, Daejeon and Ulsan, and 74 cities (si) and 85 counties (gun). The Korean language, like Hungarian, Turkish, Mongolian and Finnish, is classified into the Ural-Altaic language group. Hangeul (the Korean alphabet) is composed of ten simple vowels and 14 consonants. A group of scholars under the patronage of King Sejong the Great developed this systematic rendition of spoken sound in 1443. 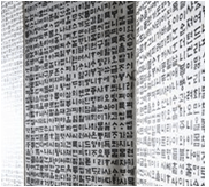 Hunminjeongeum , a historical document which provides instructions to educate people on the use of hangeul, is registered with UNESCO as a World Heritage, and UNESCO also awards the “King Sejong Literacy Prize” every year in memory of the inventor of hangeul. Hanbok has been the Korean people’s unique traditional costume for thousands of years and represents the beauty and grace of Korean culture. 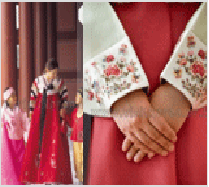 The beauty of hanbok lies in the harmony of its colors and its bold, simple lines. Its beauty and quality are judged by three elements: otgoreum, or the long ribbons of the top that form a knot; baerae, or the curve of the sleeves; and git, the way the band of fabric that rims the collar and the front of the top overlaps. The design symbolizes the principles of the yin and yang forces in Asian philosophy. The red and blue circle respectively represents the proactive cosmic forces of the yang and yin. The two forces together embody the concepts of continual movement, balance and harmony that characterize the sphere of infinity. The trigrams on each corner of the rectangular flag symbolize heaven, earth, water and fire. 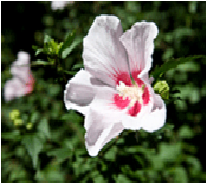 Every year from July to October, a profusion of mugunghwa (Rose of Sharon) blossoms grace the entire country. Unlike most flowers, the mugunghwa is remarkably tenacious and able to withstand both blight and insects. The flower’s symbolic significance stems from the Korean word mugung, which means immortality, and accurately reflects the enduring nature of the Korean culture along with the determination and perseverance of its people. The prominent feature of a Korean table setting is that all dishes are served at the same time. Traditionally, the number of side dishes varied from three for the lower classes to twelve for royal family members. Table arrangements can vary depending on whether a noodle dish or meat is served. Formal rules have developed for table setting, demonstrating the attention people pay to food and dining. Compared to neighboring China and Japan, a spoon is used more often in Korea, especially when soups are served. If your appliance plug has a different shape, you may need a plug adapter. Any product with this “Tax Free Shopping” sign will give you a refund on VAT. You must depart Korea within 3 months of the purchase. Purchase your items at any shops with this “Tax Free Shopping” sign and receive a payment slip. When departing, you need to get a stamp issued from the customs officer after showing him the purchased items and payment slip. At the Cash Refund Office in the airport, you can receive the amount of VAT. You may also be able to get a refund at the airport of your destination. 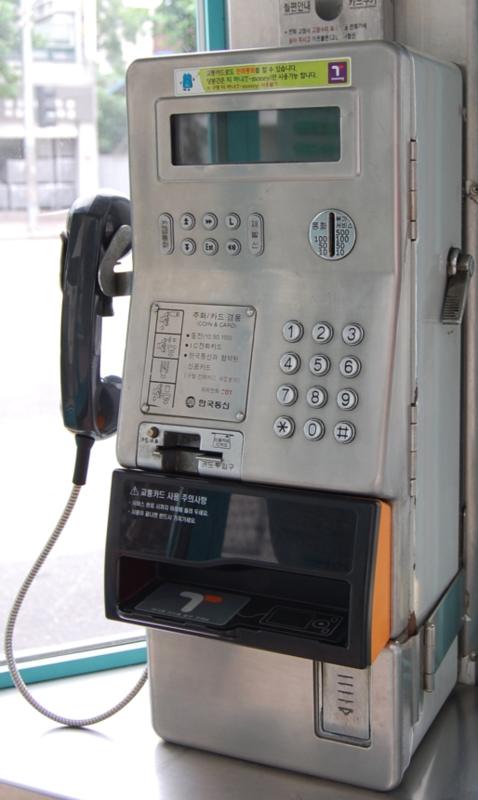 There are three types of public telephones in Korea: coin-operated telephones, card phones, and credit card phones. A local call costs 70 won (US$0.07) for three minutes. Intercity calls cost considerably more. Coin phones return coins that are not charged, but do not return change for partially used 100 won coins. Card telephones can be used to make international calls as well as local and intercity calls. Telephone cards come in 2,000, 3,000, 5,000, and 10,000 denominations and are on sale in shops close to telephone boxes and in banks. 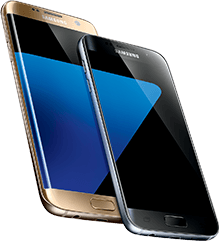 There are also credit card phones, which you can use with major credit cards. CDMA cellular systems are widely used in Korea. SK Telecom and KT are providing a SIM card roaming service to allow you to use your GSM subscription in Korea. At the International Airport, you can rent a special CDMA cellular phone which accepts your SIM card. 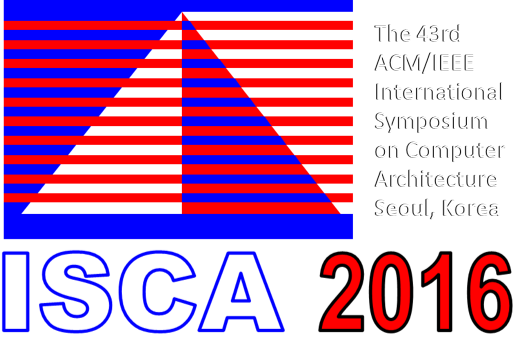 Please check the links below for more details.